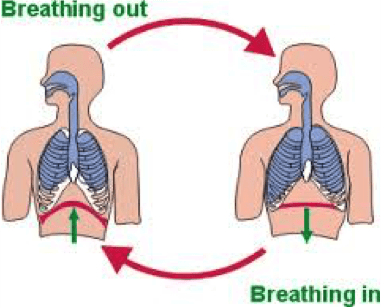 Human beings breathe – inhale and exhale – 10,000 to 70,000 times every day just to sustain life. Not really surprising, but, we don’t really pay that much attention to the air we are breathing. We as North American’s spend countless hours and billions of dollars deciding on the food we eat, beverages we drink, the lotions we put on our skin and the effects they have on our health and well-being. However, when was the last time you heard someone actually discussing the quality of the air they breathe? If we are inhaling air into our lungs 10,000 to 70,000 times a day, doesn’t it make sense to at least consider the quality of air we breathe? So, let’s take a moment to consider what IS in the air we breathe. How is the air I am breathing effecting my home and health? 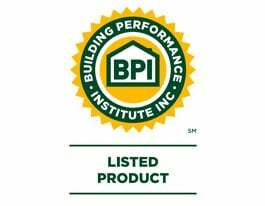 Temperature – Humidity – VOCs – Allergens – Particle Counts – Bacteria – Building Materials – Type of Construction – Exchange Rates – Occupants – HVAC – Insulation – etc. The U.S. Environmental Protection Agency, EPA, tells us that “The air in the average American home is a minimum of 5 times (and can be as much as 100 times) more polluted than outdoor air.” There are quite a few reasons for this…from the off gassing of toxins we use in building our homes such as glues, epoxies, resins, varnishes, upholstery, carpets, paint fumes, formaldehyde, and other VOCs to the type of foundations our homes are built on, basements and crawlspaces, add in our quest for insulation and energy efficient upgrades to the mix and we’ve got quite a toxic cocktail of indoor air quality! For homes with basements, indoor toxins are greater than for those homes without basements. Unfinished and finished basements both create risks for toxic exposure throughout the whole home. A recent study indicated that foundation walls, due to their porous nature absorb 10-15 gallons of water vapor per day, which is responsible for up to 80% of the home’s indoor moisture, and can accelerate the growth of bacteria, mold and mildew as well as attract bugs, spiders and pests. We can all agree that it is important to control water leaks and water entry, from the basement into the rest of the house. Additionally, controlling mold is important as this toxin, will place your family at significant health risk. The humidity and condensation in the basement is what most often creates a mold risk. 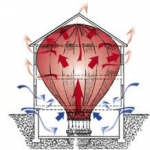 Adding the “Stack Effect” (the movement of air into and out of home) to this dynamic exaggerates the introduction of toxins from the basement into the home. The rising warm air draws air in through either open doors, windows, or other openings and up from basement. Actively drawing dirty basement air into the living environment above is detrimental to providing a healthy indoor environment. For homes with crawlspaces, indoor toxins are greater than for those homes without crawlspaces. The average home built on a crawlspace has 80 square inches of air communication between the crawlspace and the living environment creating higher risks for toxic exposure throughout the whole home. Much like basements, these spaces are also built into the earth and surrounded by soil on all four sides and oftentimes have dirt floors as well. The water in the soil makes its way into these spaces in its vapor form (humidity) due to the laws of physics, ‘Wet Moves to Dry’. A recent study indicated that crawlspaces, due to their porous nature absorb up to 20 gallons of water vapor per day, which again, is responsible for up to 80% of the home’s indoor moisture. This process contributes to the acceleration of foundation decay, bacteria growth, mold and mildew as well as attracts bugs, spiders and pests. 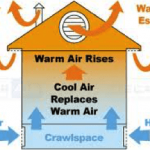 Once again, adding the “Stack Effect” (the movement of air into and out of home) to this dynamic exaggerates the introduction of toxins from the crawlspace into the home. The rising warm air draws air in through either open doors, windows, or other openings and up from crawlspace. Actively drawing dirty crawlspace air into the living environment above makes indoor air quality even worse. Crawlspace Vents? Many crawlspaces were initially built with passive vents to the outside to allow the crawlspace to be “vented”. These passive vents are dependent on the wind and weather to be effective. Building code across North America are now changing as passive vents to the outside, are actually contributing to a dirty crawlspace by introducing more moisture into an already damp space. Whether it be a basement foundation, crawlspace foundation or a combination of the two, they are contaminant sources contributing the poor indoor air quality in the home. Add to that a whole host of other pollutants that we build our homes with, clean our homes with and bring into our homes on a daily basis. The reality is that every day our families are breathing basement and/or crawlspace air that has been mixed with contaminated house air. One of the more obvious symptoms of this growing epidemic of poor indoor air quality is the substantial rise in allergies and asthma in recent generations. According to the Asthma and Allergy Foundation of America we have seen “a 700% increase in people suffering from asthma and allergies in the past 20 years, leading to a staggering 50% of North American’s reporting allergy symptoms”. A fairly recent condition labeled “Sick Home Syndrome”, may be to blame. The good news is homeowners can do something to combat this growing health concern. Even better news is that it does not include major home renovations or serious lifestyle changes…by simply increasing the home’s air exchanges YOU can make a difference. Helping to reduce the natural stack effect (tendency for basement/crawlspace air to rise up into the living space) YOU can improve your indoor quality. This will also provide a path of escape for the bad air to exit which will further prevent polluted indoor air from accumulating to unhealthy levels and entering the living environment. By exhausting that bad air out and increasing air exchanges you can dramatically improve the indoor air quality…and the health of the occupants! It’s really a very simply solution to a complex problem. 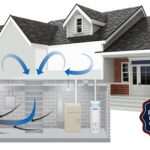 By increasing the ventilation rates in the home sourced at the lowest part of the foundation, you will see a reduction in indoor allergens, humidity levels, trapped gasses and pollutants, as well as all of those nasty chemicals we introduce into our indoor environment every day. Create a fresher, cleaner, drier indoor air environment naturally, without expensive air filters, air cleaners, scrubbers, etc. When you increase ventilation there is no need for any harmful air fresheners, sprays, plug-ins, candles, chemical masking agents or fragrances. These synthetic compounds do nothing to improve the air quality and oftentimes add dangerous chemicals further polluting an already compromised air quality. If we need to breath up to 70,000 times per day just to sustain us, it’s probably a good idea to be sure that the air we are inhaling is the healthiest it can be to support us in being the healthiest we can be! Create a healthy and happy home!